Hydrostatic underwater weighing is typically used to measure someone’s body composition, or their body fat to lean mass (body weight minus the fat). Since “muscle sinks and fat floats,” explained exercise physiologist Elizabeth Quinn, “a person with more body fat will weigh less underwater and be more buoyant.” Yet, as relied on as this technique is, the Agricultural Research Service (ARS) Body Composition Laboratory of the Children’s Nutrition Research Center in Houston, TX, proposes a modern makeover of sorts. Well, the actual water anyway. 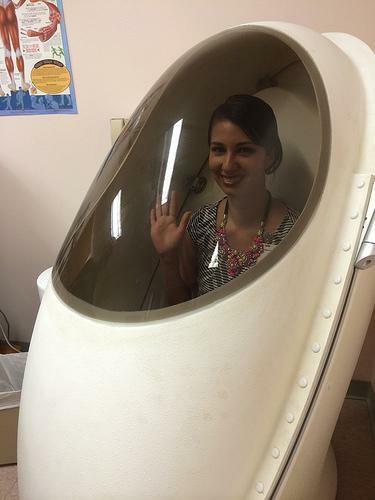 After a fitness or wellness facility acquires the Bod Pod for a cool $32,000, users still need a (lycra) swimsuit for their session that will probably cost them an additional fee (the going rate in Colorado is $75). Gonzalez-Quiroz has no doubt seen how a normal amount of body fat lessens the likelihood of some diseases. As found by the American College of Sports Medicine, “a body composition within the recommended range suggests you have less risk of developing obesity-related diseases such as diabetes, high blood pressure, and even some cancers.” Yet, body composition that’s too low presents a whole host of problems, too. The ACSM reported low levels of essential fats can work to negatively affect organ function and overall well-being. Back in Colorado, “the people who get the biggest surprise when they come in for the Bod Pod are the people who are a little skinnier, with a smaller build, who do a lot of endurance sports but don't have much muscle mass,” Kent McCurdy of FAST, Fitness and Sports Training, told The Denver Post. “I tell patients to avoid referencing their BMI [body mass index] measurements. I tell people that it's counter-intuitive. Often, they need to eat more calories to increase their muscle mass. But that's clean calories, not processed food." McCurdy is right; body composition and BMI are not the same. Technology like the Bod Pod is what makes that clear. Yet, outside of the pod, paying attention to major organs can indiciate if the body is being damaged by excess body fat.